Roy Lichtenstein (1923–1997) has long been considered one of the key figures in the development of Pop Art. His signature brightly colored paintings are cornerstones of museum collections the world over. His subject matter, drawn from visual fragments of popular culture, is emblematic of an entire movement. An extraordinary exhibition organized by the Morgan Library & Museum presents an important series of large-scale, black-and-white works as a group for the first time and examines Lichtenstein's less-known exploration of the medium of drawing. The fifty-five drawings on view offer a revealing window into the development of Lichtenstein's art. They were created during the early- and mid-1960s when he began for the first time to appropriate commercial illustrations and comic strips as subject matter and experimented stylistically with simulating commercial techniques of reproduction—the famous Benday dots. The work represents an essential and original contribution to Pop Art as well as to the history of drawing. The year 1961 was a momentous period of transformation for Roy Lichtenstein. Thirty-eight years old and regularly exhibiting in New York since 1951, he was by many measures already a mid-career artist working primarily in painting in Cubist and Abstract Expressionist styles. But in 1961 his art made a radical departure from these precedents. Influenced by the happenings staged by Allan Kaprow, George Segal, Claes Oldenburg, and others, which incorporated everyday objects and popular culture, Lichtenstein turned to an entirely new imagery culled from the contemporary world of advertisements and comic books and adopted the graphic techniques of commercial illustration. The exhibition demonstrates how the act of drawing took on a central role in his practice at this stage, both as a favored medium in its own right and as a powerful means of translating and transforming his sources of pop iconography. The exhibition provides a rare opportunity to study Lichtenstein's black-and-white drawings as a group, to explore their technique and subject matter, to draw attention to Lichtenstein's revolutionizing contribution to the history of drawing, and to bring to light the critical insights these drawings offer into the artist's larger body of work. The drawings constitute an original body of work independent from Lichtenstein's paintings. Although he produced many black-and-white paintings during the 1960s, the drawings were in fact conceived independently and cannot be interpreted as studies for the works on canvas. Though the exhibition provides some background, Lichtenstein's motivations in creating these works—which did not have the commercial value of paintings—remain enigmatic. Moreover, these drawings differ significantly from Lichtenstein's main body of works on paper. They do not belong to the category of preparatory studies and also stand apart from the drawings of other major pop artists, notably Claes Oldenburg, Andy Warhol, and Jim Dine, whose treatment of pop subjects cultivated an old-master look that is absent from Lichtenstein's black-and-white drawings. The exhibition traces the development of Lichtenstein's drawing style in the 1960s, notably his technique of simulating the Benday dot-printing process—a characteristic feature of his style. The viewer can follow the development of the black-and-white drawings through the rendering of these dot patterns. Lichtenstein never drew them freehand but experimented with a variety of approaches, which he perfected over the years to mimic the effect of mechanical printing. This technique became inseparable from the meaning of the finished work, producing, in the words of critic Lawrence Alloway, "an original artwork pretending to be a copy." By imitating mechanical modes of reproduction, Lichtenstein presented a critical challenge to prevailing notions of artistic originality and authorship, paradoxically achieving an unmistakable hallmark of style in the process. The exhibition also explores the sources—comic strips, advertisements, magazines, and mail-order catalogs—of Lichtenstein's subjects. In addition to the drawings themselves, related sketches are on display as well as clippings from newspapers, magazines, telephone books, and other sources from which Lichtenstein drew inspiration for the works in the exhibition. The show underscores the two themes that came to dominate the drawings, household objects and comic-book scenes of war and romance, and illustrates how Lichtenstein endowed them with a heightened psychological resonance and formal intensity, raising them to the level of high art. The earliest drawings are also the most basic. A centrally placed, single object often stands against a blank background—an airplane, a couch, a cup of coffee. Others are based on diagrams demonstrating how to use a product by depicting a hand or foot interacting with an object, such as Hand Loading Gun and Foot Medication. When figures are included, as in Man with Coat and Girl with Accordion, they have plain, ordinary features, as oppose to the conventional beauty of male and female figures that would soon appear in his comic-inspired works. By 1962 the drawings began to incorporate more elaborate source images, which introduced more complex compositions. Keds, for instance, was inspired by an advertisement for Sears, Roebuck & Company. In a sly reference to contemporary abstract art, Lichtenstein significantly reworked the composition to give greater emphasis to the geometric pattern of the sole. Bratatat and Jet Pilot are two drawings inspired by war comics. Both are close-up views of a pilot in his cockpit, with much attention lavished on the details of his accoutrements. The exhibition also includes a piece from a little-known installation done by Lichtenstein in 1967 that represents an extension into three dimensions of his black-and-white drawings on paper. As part of the Aspen Festival of Contemporary Art, Lichtenstein drew with black tape on the wall of a white room, outlining its architectural elements. The only extant part of this project, a door with the words Nok!! Nok!! is featured together with unpublished photographs of the whole room. Roy Lichtenstein: The Black-and-White Drawings, 1961–1968 introduces an entirely new dimension of the artist's work to audiences more accustomed to seeing his brightly colored paintings. Although Pop Art in general has been the subject of a number of shows, they have featured few drawings and rarely addressed the practice of drawing by pop artists. The exhibition is organized by Isabelle Dervaux, curator of Modern and Contemporary Drawings at the Morgan. After it closes in New York, it will travel to The Albertina in Vienna, Austria (January 27 through May 15, 2011). Roy Lichtenstein: The Black-and-White Drawings, 1961–1968 is underwritten by the Terra Foundation for American Art. Major support is provided by an anonymous donor, The Broad Art Foundation, Doris Fisher, Agnes Gund, and Larry Gagosian, with additional assistance from Barbara Bertozzi Castelli, the Dedalus Foundation, Inc., and David Nash and Lucy Mitchell-Innes. 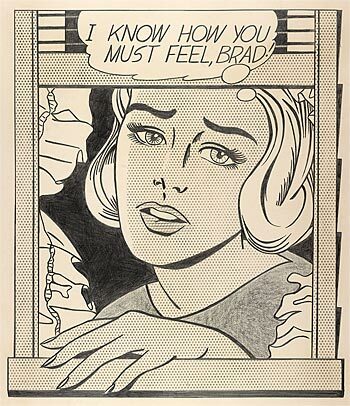 Roy Lichtenstein, I Know How You Must Feel, Brad!, 1963, graphite pencil, pochoir, and lithographic rubbing crayon. Private Collection. © Estate of Roy Lichtenstein. Photography: Schecter Lee, 2009.